I have a confession to make right now: I have some food stuck in my teeth. I know it might be a hard confession to comprehend, but it’s true. And I also have another confession: I kinda like Saw III. It might be one of my favorites in the ongoing Saw franchise. That might be just as hard to comprehend. Now if only I could combine my two confessions and get this damn food out from in between my teeth……..
Oh my stars! Today’s my lucky day! 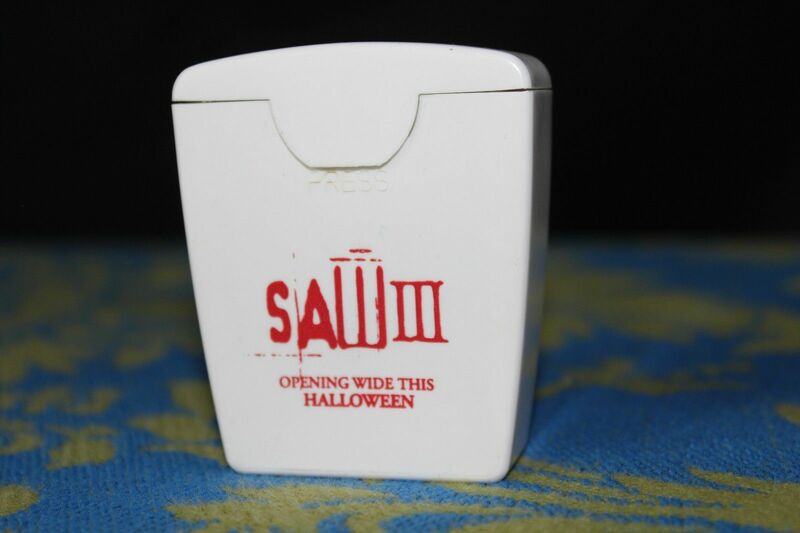 Yes, that is actually some promotional dental floss released in correspondence with the Saw III movie. And it’s complete with the hilarious tagline “Opening Wide This Halloween“. Now, the good news is that a seller on eBay is letting this go to one lucky bidder. The bad news is that it might be the most expensive dental floss you ever bought because it will set you back about $20. If you want to check out the listing and more pics, then head on over HERE. Or if you just want to sit there with food in your teeth like me, then you can do that as well.